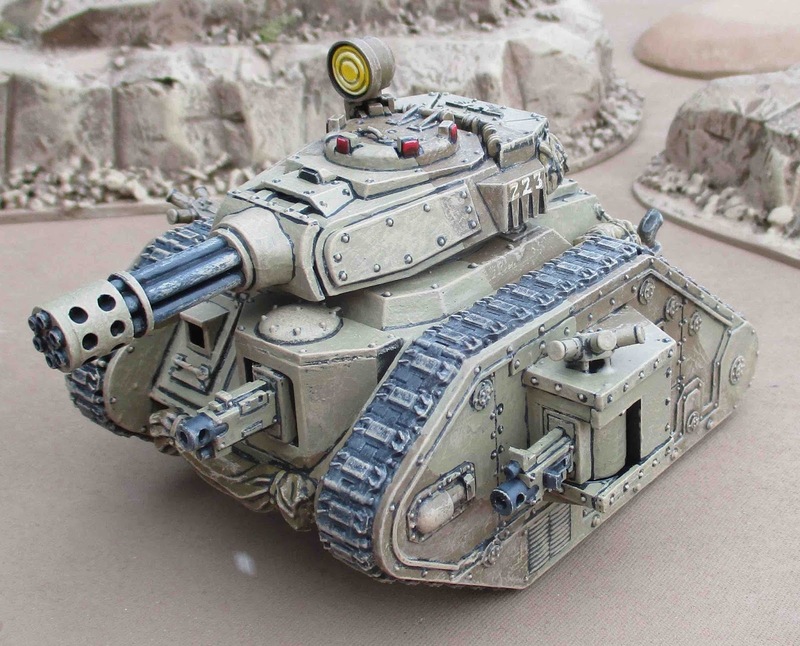 The Astra Militarum Codex refers to this tank as an "unsubtle built hose" due to it's Heavy20 type - with the new Grinding Advance rule that's 40 (FORTY!) dice to throw at one unit. I... couldn't resist putting one together for my Leman Russ troop. I know, I know... I glued the forward bolt gun in upside down... I discovered this as I started to paint it and was furiously angry. despite my best efforts to pry it out - I couldn't do it without damaging the model so I decided to leave it for now and hope no one notices (honestly, would you have, if I hadn't mentioned it?). At some point I'll just carve it off and glue on a new one... Ugh... so annoying. I'm usually pretty careful about this sort of stuff! My megalomaniac plan was to eventually have five - to fill out a "troop". The writing on the back is, again, my attempt at Arabic script - it's supposed to say Zakat - or "almsgiving" one of the five pillars of the Tallarn version of the Imperil Creed. Most of the stowage on the tank is from a Tamiya 1/35 kit - Allied Vehicle Accessories Set. 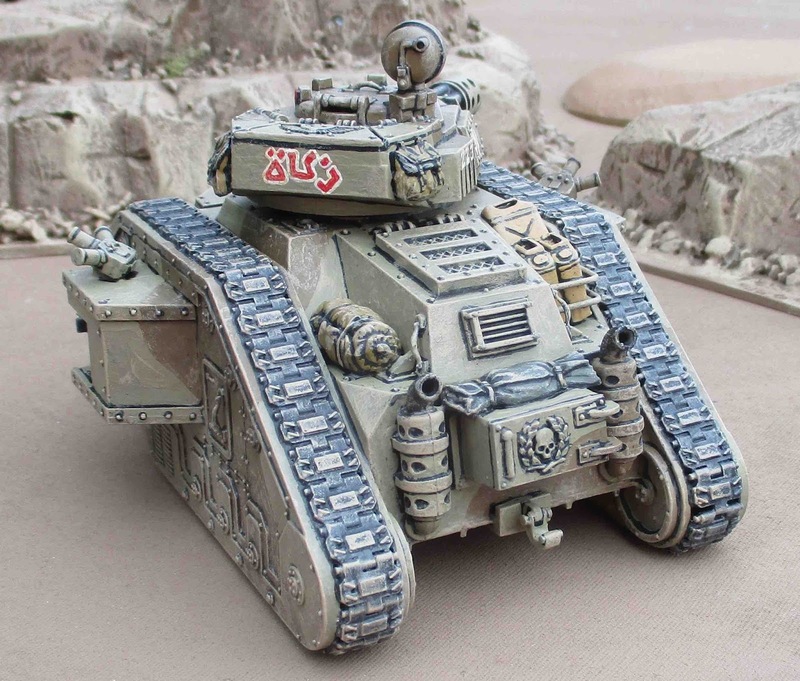 As everything on GW Astra Militarum tanks is goofy-cartoony-exagerated, they don't actually look out of place, despite being a larger scale! I have an Infantry Squad, a commander and a Command Squad on the workbench that I'm actively working on this week. I'm hoping to get in another game of The Pikeman's Lament later this week, so stay tuned for a report of that game as well! If you need the instructions, I am sure I have a copy hanging around in my "tank" box. Thanks! I will definitely pester you for them when I get around to assembling it! Looking good! The script and the stowage give it some nice character. Thanks Preacher. I like the idea of these being festooned with extra kit - like they're expecting to be out there for a while. I've seen others that have put camouflage nets on theirs and I'd like to experiment with that at some point, but I don't have time right now! Thanks Dave! I actually have spares, though, so it doesn't really matter. I also carved part of the top of the gun (the PROPER top!) off when I realized the mistake to make it look a bit less obvious (that little foresight-like-thingie) so it's not going to really be useable anyway even if I did manage to cut it off clean with a minimal kerf. 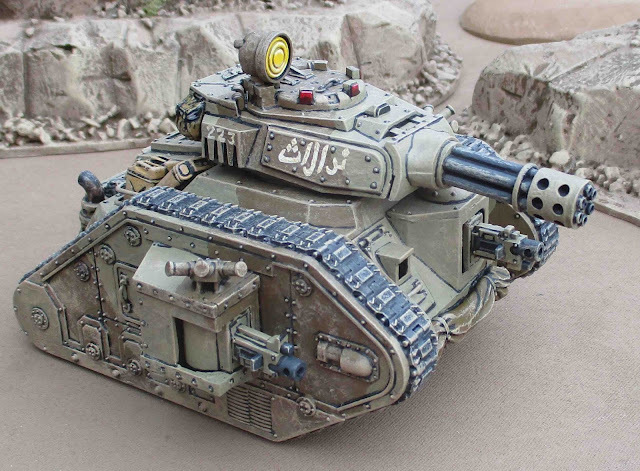 Lovely looking tank and who really cares about the upside down bolter, it looks great! I've got an ancient leman russ kit knocking around and I'm sure I could copy/send you instructions, you could have the tank if you want as I can't see any possibility of me building it! Oh and I think the script is fab btw. I actually found some instructions through google! Ha! That is too funny! Thanks!